You know those days when you plan on getting a bunch of things done. Well... taking these pictures (along with a few other looks) was on my agenda; however, the wireless remote for my camera had other plans. Half-way through these pictures, it decided to stop working. At first, I thought it was the battery, but unfortunately it was not. I am just happy I was able to get these pictures. As I mentioned in a few other posts, blush (or pink) up until this past year, has not been a color I have owned, but I love the softness of it and how it pairs with leopard. 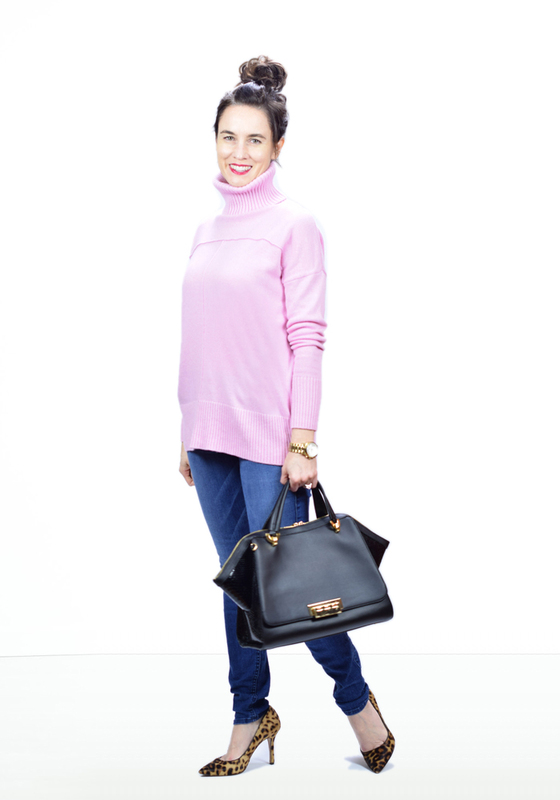 It also works great with black and even paired with other pinks - like fuschia! Hopefully, I will have my remote issue fixed and be back with more outfit looks by the end of the week. Thanks for reading. Loving the blush color, I really need to find something I like, but haven't found anything yet...I'll probably find it and then it won't be "in" any more...oh well! I hate when remotes don't work...what are you using for your background? I bought a white photography backdrop - I got tired of trying to fight the wind/cold weather to take photos. No more crazy hair pictures! Beautiful combination Lisa! That sweater looks so cozy and chic! In my mind, blush and leopard always go well together. Love the leopard and pink combo! That bag is fabulous! That is a great look! Love the leopard and pink as well! Ugh, I hate camera problems! Loving this pink on you. So good with the leopard. This sweater is so cute! Love it on you. You look gorgeous in pink! Love this combo! It's always such a task to fit a shoot into a day with other things. But you got plenty of great shots! Love the pink and that shade of lipstick! Love the leopard pumps too!! I keep seeing them everywhere lately. I seriously need to get some. Such a great look on you, the blush is so pretty!! Your hair looks adorable up Lisa! I would have never thought to pair blush with leopard but I LOVE it!! Loving the blush and leopard combo! That bag is fabulous! 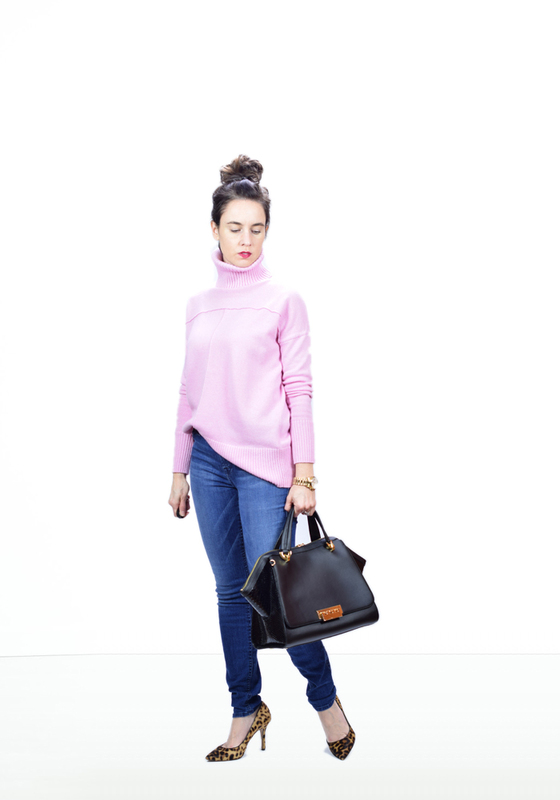 That top knot looks adorable on you and so does that pink sweater! The leopard heels are a fun twist to the outfit! Funny (or not) how we make plans for our days only to have one little kink throw a monkey wrench in the works. Technology. Can't live with it, can't live with it. Love this blush, baby pink. Going to look for something in this color and a faux leather moto with my paycheck this week. Thank you for always providing reasonably priced options for us retired librarians. Love the blush color!! Looks perfect on you! I love this inspiration! Such a pretty shade of pink on you and I love the simple backdrop! I love this look, so clean fresh and chic. Feel free to stop by my new weekly Weekend Wear Friday linkup and share your fabulous styles! Very pretty look! I have never tried blush and leopard together and now thinking how great they look together. Hope your remote is working now. Thanks for linking up with Fabulous Friday! Hope to see you back this week, Lisa. What a gorgeous outfit! I am love with those pumps...I have a similar pair! they look fab with that sweater! Just curious what you use to get your all white background? I love it!! Blush pink and leopard combo looks really great, I also really like the bag.